In this month's edition of How To Fix, we ask the experts for their solutions for horses who don't like being caught in the pasture. Any horse owner or farm worker has been through the cat-and-mouse game before, whether with a young horse or an adult, and it takes a lot of time and energy. Once you do finally catch the miscreant, though – can you break the cycle… and is there any medical basis for this behavior? Dr. Katherine Houpt, professor emeritus of behavioral medicine at Cornell University's College of Veterinary Medicine: I think the main reason they don't want to be caught is that horses don't want to work. Horses, in a natural state, walk. They hardly ever do anything else. So if we want them to trot around the ring 30 times or jump four feet, a lot of horses would rather not do that. The other thing is that horses may know when they're about to get veterinary treatment. If someone new is with you, someone new in coveralls, that might mean they're going to at least jabbed. I think you can make being caught something desirable, at least nine out of ten times. Whenever you catch the horse, give it a piece of carrot or sugar, or some kind of food reward so it's more highly motivated to be caught. If that ratio of being caught and getting a reward is higher than the ratio of being caught and having to do something you don't want to do, that helps a lot. Dr. Bryan Waldridge, internal medicine specialist at Park Equine Hospital: I'm more than happy to tempt them with feed. People get mad at you if you jump to feed, but I'm more than happy to try to catch them with feed. I'm too old to chase them anymore. Medically, I really can't think of anything other than they've had some bad experience somewhere or are just scared. Why do people not want to use feed? I think some people say 'That's a cop-out, you should make the horse come to you.' I'm all about path of least resistance, so I'm going to grab the bucket. If the horse wins, that's fine. I get to go on and do something else. Luke Sullivan, broodmare manager, Mt. Brilliant Farm: My first thought is I give a lot of mares Regumate or other treatments. They catch on pretty quick to who's coming with medicine and who's got food. I'd definitely attribute it, at least in some cases, to mares knowing they're about to get a treatment or do something they don't want to do. If I've got a big herd of broodmares for instance that have just been weaned recently, they know they're going to come into a stall, not particularly for feed, and they're not real keen on that. The other thing is a lot of it has to do with the way they're handled. A lot of times if you have guys who are a little rougher on mares, they know that's coming and it won't be a pleasant experience to be caught. As with men, food is the way to any horse's heart. With weanlings I've just weaned, we really try to train them to the sound of a feed bucket shaking by the gate. A lot of times, a field full of weanlings aren't standing by the gate waiting for you like a bunch of broodmares waiting to be fed will be. 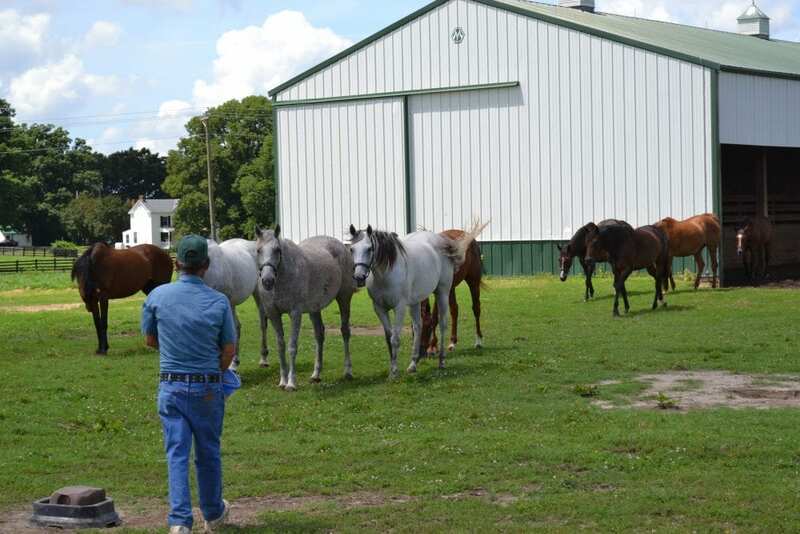 Make everything a pleasant experience for them — having feed and water and hay in the stall for them, but the motivating factor [in the field] is the feed. This entry was posted in Horse Care, How To Fix, NL Article and tagged catching horse, catching horse in field, dr. bryan waldridge, dr. katherine houpt, equine behavior, horse behavior, horse is hard to catch, how to fix, luke sullivan by Paulick Report Staff. Bookmark the permalink.